On previous occasions the Williams-BMWs have been in front and have had to hold off concerted attacks in those early laps. One such attack ended in Austria with Juan Pablo Montoya and Michael Schumacher going off together. 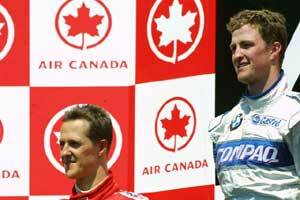 In Canada it was different because Ralf Schumacher was behind his brother Michael. In the first few laps it looked as though Michael was not going to be challenged. After a lap he was a second a half ahead of Ralf but then the gap stabilized until lap 13 when the Michelins lit up again. That lap Ralf took three-tenths off his brother. On lap 14 he took another four-tenths and then he was there, riding along on Michael's tail, hoping for a mistake. Pushing all the time. Even then Michael knew he was in trouble. "I had the upper hand," said Ralf. "I was following him quite easily. My car was just brilliant today. I knew that we had a lot of fuel on board and so I thought I had better wait until he pits and then I could try to pull the gap out rather than trying harder, maybe making a mistake and then losing it." For lap after lap after lap the brothers ran together but overtaking is so difficult these days that Ralf only had a few looks to see if Michael was asleep. There was a Safety Car after which Michael pulled out a big advantage when Ralf's tires picked up some extra rubber but as the tires cleaned themselves up, so Ralf closed the gap again. And then Michael knew he was doomed. Eventually after 46 laps of the Circuit Gilles Villeneuve, Michael headed for the pitlane. Ralf's lap times dropped by a second. Michael was dead meat. He was chugging around with a big fuel load and for five laps the gap grew. And then Ralf pitted. He came out more than five seconds ahead of his brother and Michael then backed off. There was a very big gap back to the third placed car and so there was no need to hurry. It was a dominant display by BMW Williams and by Michelin. Just as we saw in Brazil and in Imola but Ralf continues to say that the team has no chance in the World Championship. He is right. "As a package we are too young," he explained. "We are going to show up from time to time I'm pretty sure but that depends on the tires. Michelin hasn't got the experience. Bridgestone has and I'm sure there will be occasions when we just don't get it right. Aerodynamically, we are not where we want to be as well so we can't go for the Championship but we can try and take advantage of some other teams' weaknesses and maybe be second in the Constructors' championship at the end of the year." That will be a tall order, particularly as long as Juan Pablo Montoya keeps failing to score. Montoya had a less than calm weekend in Montreal. After an incident with Jacques Villeneuve in Friday practice, the two men got very excited during the driver's briefing and they ended up with Villeneuve at Montoya's throat (quite literally). They then spent the rest of the weekend mumbling nasty things about one another. The pair were side by side on the grid and there was much speculation that this would cause some excitement at the first corner but as Villeneuve's start would have made a snail proud there was no showdown. Montoya was running around under pressure from Rubens Barrichello when he crashed heavily. He said that he thought something had broken but the team could find no evidence of any breakage when they checked the car after the race. "It is really strange," said Montoya. "As I went over the curb and put the power on, the rear stepped out. I don't know what happened. I was doing exactly the same every lap." But, at the end of the day, it was a day for rejoicing at BMW Williams. In more ways than one. What many people did not know was that the engines featured a brand new camshaft which the Germans snuck in very quietly. To start with they were worried and the cars had more wings than were needed to keep the revs slightly below where they should have been. But in qualifying the gloves came off. And in the race too. BMW not only has the most powerful engine in F1 at the moment but it is improving all the time. Very impressive. Ferrari cannot match the BMW in either power or in consumption and this means that the pit stop strategies are not as flexible as the team would like. Keeping the drivers out on the track makes a big difference and Ferrari has not been doing it and so for Montreal the team had an engine which was supposed to be more efficient. But it did not seem to make much difference and Michael Schumacher had to settle for second. That was fine for Michael because it helped him extend his World Championship lead on a day when David Coulthard's luck was out. On this occasion, Ferrari's cause was not helped by Rubens Barrichello's efforts. Rubens was fifth in qualifying and then got ahead of Jarno Trulli on the first lap. He then went past Coulthard on lap three but then things started to go wrong. "I had to switch off the traction-control because it was causing a misfire," he said. "It might have been a problem with a sensor." Whatever it was, it caused him to spin off on the sixth lap. Barrichello rejoined in 14th position and the car was not as good as it had previously been. But he charged back and was running right behind Montoya when the Colombian went into the wall. Rubens tried to avoid the Williams and lost control and crashed on the other side of the road. The crash resulted in the Safety Car being sent out and the race neutralized. McLaren was also having a bad day. Or at least David Coulthard was. He had a problem with his front suspension and after the race the team was keeping very quiet about it. It was described as "a partial failure of the left-hand front suspension." What did that mean? All the engineers shuffled their feet and mumbled "Can't say". Ron Dennis explained that it was all to do with a widget which had broken but said that the team would need to analyze what had happened to figure out how it had happened. David Coulthard had a different view. "When I went to the grid a nut from the front suspension was in the cockpit," he said. "I threw it over the pit wall before the start of the race." We would soon discover that the nut in question was important ” but not that important. The effect was that a suspension link was not joined up and that meant that the cross-weighting of the car was all wrong and it was difficult to drive. McLaren got some consolation from the fact that Mika Hakkinen ended the day third. His first podium of the year. But it had been a triumph of perseverance over performance. Mika had qualified only eighth and he dropped to 10th on the first lap. He made no real progress until lap 35 when the men ahead of him, Kimi Raikkonen and Ricardo Zonta, collided. Mika snuck past the pair of them and then put the hammer down and ran a long stint which enabled him to get up to third. He then ran fast enough to hold on to third after his pit stop. "I was not 100 percent happy with the car, " he admitted. "It has been a really disastrous start to the season, so it's nice to be on the podium." Behind Mika at the end of the race was the sensation of the season ” Kimi Raikkonen, scoring his third set of points in eight races. And he is getting better all the time. The Finn would probably have had his first podium but for a high-speed bump with Zonta. The Finn did not understand why the Brazilian had run into him; Zonta did not understand why Raikkonen had braked. In the end both men made it to the flag. This was more than can be said for Raikkonen's more experienced team mate Nick Heidfeld. He was punted out on the second lap when Eddie Irvine, running a low-fuel Jaguar, tried a less than advisable move and the pair of them went out. "When you are 15th on the grid you have little choice but to get stuck in," said Eddie. "And that is what I did. It certainly wasn't his entire fault and, to be honest, I accept two-thirds of the blame for this one." In the circumstances it was most unfortunate because it could have been a chance for Jaguar to pick up some more points. In the end the team did get one thanks to the efforts of Pedro de la Rosa, who finished sixth. Behind Raikkonen at the finish was none other than Jean Alesi, scoring for Prost for the second time in two races. Jean was ecstatic because he had qualified only 16th and had a rather poor start which had dropped him to 19th. But from there he gave his all ” as he always does ” and his one-stop strategy meant that he rose to fifth place as those around him stopped and dropped back. The stop dropped him from fifth to ninth but then as others fell by the wayside so Jean moved on up. "These points mean a lot to us," said Jean. Luciano Burti finished eighth in the second Prost. He was not helped by having to do a manual start and was last into the first corner. In the early part of the race he shadowed Alesi but then he nearly ran into the back of him and had to take to the grass and that meant that his radiators were filled with grass and so he had to pit earlier than intended and that lost him the ground he needed to stay with Jean. Jordan had a very difficult weekend. After his accident in Monaco, Heinz-Harald Frentzen began to have problems with dizziness. This is not surprising as he withstood 18G in the crash. In addition to being dizzy, Heinz reported that he was having trouble concentrating and so Saturday morning the team decided that he would be stood down and that test driver Zonta would get the job. In the circumstances he did a remarkable job, qualifying 12th and then racing along until being surprised by a sudden braking moment from Raikkonen. Damage was light and Ricardo eventually made it home in seventh place. Trulli had done a lot better than that. He had qualified fourth, an impressive effort. For most of the race he ran in fourth place. His mid-race pit stop dropped him from fourth to eighth but then he moved back up to fourth again and was looking safe until the final few laps when he ran out of brakes because of a master-cylinder failure. He was disappointed and frustrated. So were the other Honda users, British American Racing. Olivier Panis qualified sixth but local hero Jacques Villeneuve was only ninth, after getting into controversy with Juan Pablo Montoya after the two collided on Friday. In the race Panis ran fifth for a long time but then succumbed to brake problems. "The car was really quick," said Olivier. "I am very disappointed." Villeneuve's race started badly when the anti-stall device was activated at the start and he chugged away in 15th position. He drove a solid race but went out of ninth place in the middle of the race when he suffered a driveshaft failure. The only other car left standing at the end of the race was the Minardi of Tarso Marques, who finished ninth despite having problems with his tires. His team mate Fernando Alonso did not have much of a chance to do his thing but went out with a driveshaft failure on lap eight. Arrows should have scored a point but Jos Verstappen's race ended with three laps to go when he realized that he had no brakes left. It did not help matters that Jos's radio was broken so the strategy all went wrong, Jos charging into the pits at the very moment that the Safety Car pulled off. Verstappen's Arrows sidekick Enrique Bernoldi got himself all tangled up with Benettons on the first lap but managed to keep going. After that he suffered the indignity of having to pit with rising engine temperatures which the team later discovered was caused by a hamburger wrapper having been sucked into the radiator. He rejoined but the engine ultimately overheated on lap 25. The less said about Benetton the better. At the first corner Button clonked someone slightly. At the hairpin Fisichella ran into Bernoldi and damaged a front wing. Going down the main straight the two Benetton boys were struggling against those with more power and at the last minute Button moved to the left to avoid being hit by Bernoldi. Fisichella was behind him but, unable to stop he ran into the back of Button. Fisichella retired. Then Button was given a stop-go penalty for jumping the start... And then to finish him off completely he suffered an oil leak. And that was that.